Zinc oxide 6.55% w/w, Methyl salicylate 3% w/w, Phenol 1.19% w/w, White soft paraffin 1.13% w/w, Light liquid paraffin 7.9% w/w, Anhydrous lanolin 35% w/w, Yellow soft paraffin 34.8% w/w, Starch 10% w/w, Octaphonium chloride 0.3% w/w. 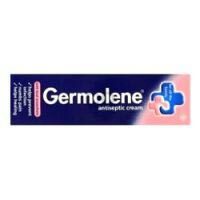 I have always had problem areas around my chin, Germolene is the most effective product I have used (and cheapest). Takes the sting and the redness out of any spot but the skin doesn't absorb it so it's best to not go outside with it on. Also smells very strong. Just don't apply to much or you may anger the spot. Reduces spot size overnight Doesn't sting Doesn't dry the skin Very cheap I wish I had discovered it earlier After a few overnight applications it has worked wonders, even on a large boil. great healer gets rid of dry skin gets rid of spots cheap quick (over night) mum said i "smelt like a hospital" worked wonders on dry + oily skin. cheap, give it a go. Reduces redness up in minutes None Absolutely brilliant product. Other topical products may sting or dry the skin; this will do neither. I applied it thinly to my severe cysts and they had settled down within MINUTES.